The winners pose with their checks. Photo by Chelsea Blair Photography. 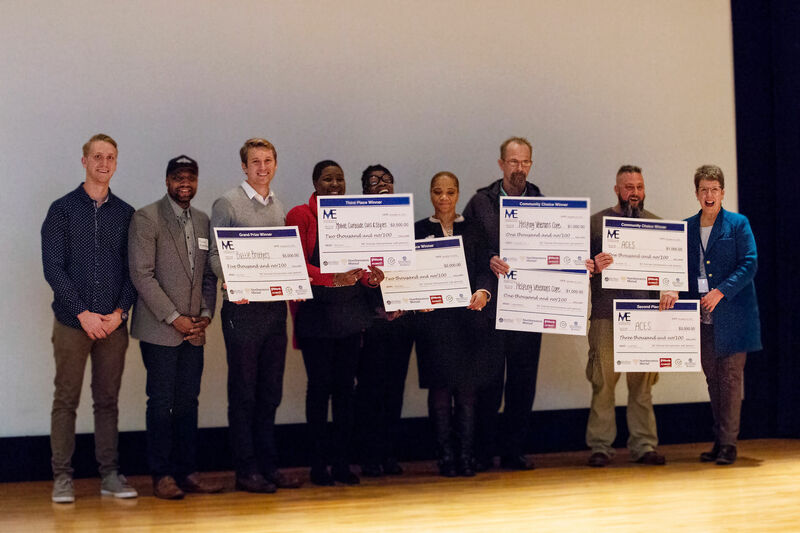 Five entrepreneurs with military background or connection took home prize money at the first showcase and final pitch competition for the Michigan Veteran Entrepreneur Lab. Produced through the Grand Valley State University Center for Entrepreneurship and Innovation, this free, community cohort program began in August. For nine weeks, the group met once a week to learn about how to start a business and all the aspects that go into it. They each had an idea or had already started a small business and work with the final pitch in sight. On November 26, thirteen business ideas and plans were presented to a panel of judges at the DeVos Center on GVSU’s downtown campus. From a bakery to meditation therapy, the ideas ranged across the board. Each presenter also had a showcase table outside the auditorium explaining more in depth their idea. Each attendee got five tokens when they arrived and could use those to vote towards any of the ideas. At the end, winners were chosen by both audience vote and judge vote. The first place award for $5,000 went to Andrew Weiss of Battle Brothers Shaving Co.
With the money, Weiss plans to start manufacturing his razors locally in Jenison, starting with a few prototypes. Additionally, he wants to get some photography and videography done for marketing the product. Second place, for $3,000, went to Trey Sumner of ACES, who also won one of the community choice picks, winning another $1,000. Olympia Nelson, of Mobile Curbside Cuts & Styles took third place, winning $2,000. Also in third place, Zaneta Adams and Henrietta Hadley with WINC also took home $2,000. The other community choice award of $1,000 went to Bill Richards, with Helping Veterans Cope Through Arts & Music. Julie Cowie, program manager, was so proud to see the progress all of the participants made over the nine-week program. She said it was a combination of the course curriculum, guest speakers, mentors and pitch practices that contributed to their development. The next cohort begins in January. Cowie said now, especially after this pitch competition, the community can really see the talent that lies within the veteran community in West Michigan. Go to www.gvsu.edu/mve/ to learn more about the program and stay tuned to sign up for the next cohort, beginning in January.